The present case has been reported in the American Journal of Emergency Medicine. A 38-year-old woman presented with vision loss in her left eye after assault 9 days prior. Visual acuity in the affected eye was 20/400, and the remainder of the ophthalmic and neurologic examination was unremarkable. Bedside ocular ultrasonography was performed. Given the extent of vision loss, ophthalmology was also consulted for further evaluation in the emergency department. 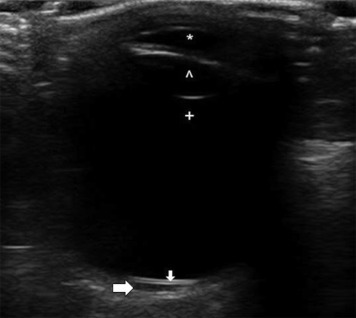 Bedside ocular ultrasonography revealed elevation of the macular retina, with a thin, hypoechoic fluid collection beneath it. 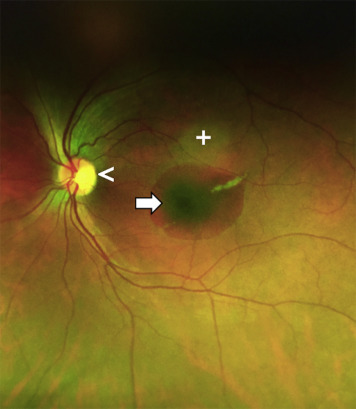 On funduscopic examination, a 2-disk-diameter area of deep choroidal hemorrhage was evident underneath the fovea, confirming the diagnosis of choroidal rupture with subretinal hemorrhage. In this patient’s case, the hemorrhage was beneath the fovea, explaining the extent of vision loss. In most instances, no immediate treatment is necessary. - Patients should be followed closely because of the risk of choroidal neovascularization and should be given return precautions for worsening vision because this may suggest its development. - Should this develop, intravitreous injections of antivascular endothelial growth factor agents can be used to prevent further vision loss.